You might have heard that taking prenatal vitamins makes your hair grow faster, healthier, or fuller, as this is the case with many pregnant women who are taking such vitamins. But what really causes vibrant locks during pregnancy -- prenatal vitamins or something else? The answer might surprise you. Chances are, if your mane is fuller and thicker during pregnancy, it's due to hormone changes and not your prenatal vitamins. The American Pregnancy Association says rising hormone levels during pregnancy means hair that normally sheds stays put leading to a fuller, thicker head of hair. Nemours says pregnancy hormones can also boost the growth rate of your hair. However after delivery, hormone levels change once again leading to increases in hair shedding (regardless of whether you're still taking prenatal vitamins). 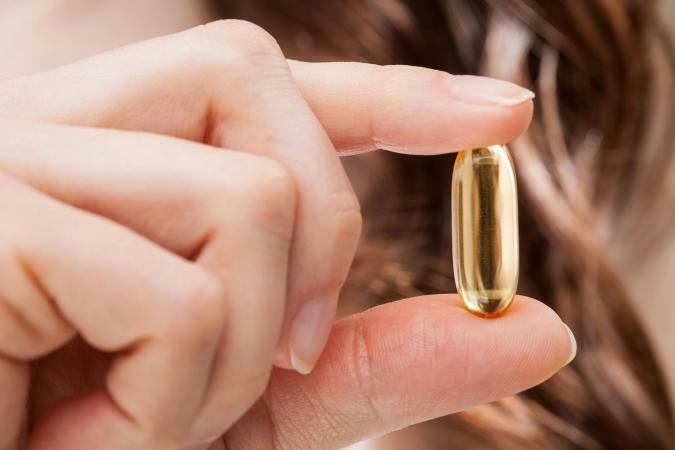 Do Prenatal Vitamins Boost Hair Growth if You're Not Pregnant? Prenatal vitamins aren't responsible for increased hair growth and thickness while pregnant, changing hormone are. However, vitamin deficiencies can cause hair to become thinner and more brittle. So, if prenatal vitamins help you correct nutrient deficiencies, taking them can lead to fuller locks when you're not pregnant. However, Katherine Zeratsky, R.D., L.D. with Mayo Clinic says taking higher levels than needed of certain nutrients found in prenatal vitamins can actually be harmful and cause vitamin or mineral toxicity. Prenatal vitamins contain high levels of iron, calcium, and folic acid. Many women taking prenatal vitamins during pregnancy continue to do so after delivering their babies -- especially women who breastfeed -- to get in extra nutrients and prevent deficiencies. However, Nemours says many women lose significant amounts of hair in the postpartum period (after delivery) or after they stop breastfeeding. The American Pregnancy Association says 40 to 50 percent of women experience postpartum hair loss that occurs 1 to 5 months after having a baby. Because excess shedding is due to hormone changes, it will likely occur whether women take prenatal vitamins or not. If this type of hair loss lasts longer than three or four months, check in with your doctor to find out if you have a nutrient deficiency. Be sure you're meeting your recommended dietary allowance (RDA) for all essential nutrients through a healthy diet and multivitamin supplements if needed, as nutrient deficiencies cause hair loss. If you're deficient in certain nutrients crucial for maintaining healthy locks (such as selenium, vitamin E, vitamin A, vitamin C, B vitamins, protein, iron, zinc, omega-3 fatty acids and vitamin D) and taking prenatal vitamins helps correct the deficiency, doing so may boost hair growth and thickness. If you're pregnant, you'll likely want to take a prenatal vitamins after talking with your doctor. However if you're not pregnant, you don't necessarily need the extra nutrients found in prenatal vitamins. Taking in too many of certain vitamins and minerals can be problematic. If you're not pregnant and your doctor gives you the okay to take a prenatal vitamin, doing so may help prevent hair loss due to nutrient deficiencies but likely won't boost hair growth if you're not deficient in hair loss-causing nutrients. If your hair growth is stagnant and you're seeking ways to boost length and volume, a few simple tips and tricks may help. In addition to meeting daily nutritional requirements, get plenty of sleep, keep stress levels low, maintain a healthy body weight, avoid pulling hair tight or brushing it roughly, avoid putting excess heat on your hair, limit hair dyes, trim hair regularly to avoid damaged split ends, and talk with your doctor about hair growth-boosting medications and procedures.